Top 20 Democracy Now! Segments of 2013 | Democracy Now! 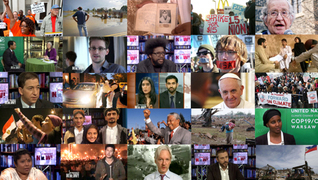 As part of our look back at the top news stories of 2013, we have complied a list of the 20 most-viewed Democracy Now! segments on democracynow.org. Join the conversation about each of these interviews on our Facebook page and share the list directly from Pinterest. In Steubenville, Ohio, members of a high school football team allegedly raped a female classmate and possibly urinated on her unconscious body over the course of an evening of partying in late August. The young men chronicled their actions on social media sites such as Facebook and Twitter. But after many in the town of Steubenville, including the high school football coach, rallied to the players’ defense, the hacker group “Anonymous” vowed to release the accused players’ personal information unless an apology was made. Anonymous has since released a video showing a male Steubenville high schooler joking about the alleged victim. We’re joined by three guests: Monika Johnson Hostler, president of the National Alliance to End Sexual Violence; Kristen Gwynne, an associate editor at AlterNet; and “X”, a member of the hacktivist group Anonymous using a pseudonym. Click here for more. Al Jazeera reporter Dahr Jamail discusses how the U.S. invasion of Iraq has left behind a legacy of cancer and birth defects suspected of being caused by the U.S. military’s extensive use of depleted uranium and white phosphorus. Noting the birth defects in the Iraqi city of Fallujah, Jamail says: “They’re extremely hard to bear witness to. But it’s something that we all need to pay attention to … What this has generated is, from 2004 up to this day, we are seeing a rate of congenital malformations in the city of Fallujah that has surpassed even that in the wake of the Japanese cities of Hiroshima and Nagasaki that nuclear bombs were dropped on at the end of World War II.” Jamail has also reported on the refugee crisis of more than one million displaced Iraqis still inside the country, who are struggling to survive without government aid, a majority of them living in Baghdad. Click here for more. For a response to President Obama’s comments on the acquittal of George Zimmerman and racism in the United States, we’re joined by Dr. Cornel West, professor at Union Theological Seminary and author of numerous books. On Obama’s remarks comparing himself to Trayvon Martin, West says: “Will that identification hide and conceal the fact there’s a criminal justice system in place that has nearly destroyed two generations of precious, poor black and brown brothers? [Obama] hasn’t said a word until now — five years in office and can’t say a word about a 'new Jim Crow. '” Click here for more. The Mississippi Supreme Court has granted a stay of execution in the Willie Manning case over an unusual admission from the FBI that its original analysis of the evidence contained errors. Manning was convicted of murdering Jon Steckler and Tiffany Miller, two white college students, in 1992. The Justice Department sent a letter saying one analyst’s testimony at trial “exceeded the limits of the science and was, therefore, invalid.” Manning’s attorneys argue that no physical evidence ties him to the murders and that testing hair samples and other evidence could identify a different killer. Click here for more. Democracy Now! has learned from supporters and loved ones of Angola 3 member Herman Wallace that he passed away early on Friday October 4, just three days after being released from prison in Louisiana after 42 years in solitary confinement, and shortly after the state announced it would re-indict him. Wallace was suffering from terminal liver cancer and would have turned 72 on October 13. Click here for more. In a national address from the White House, President Obama announced he is delaying a plan to strike Syria while pursuing a diplomatic effort from Russia for international monitors to take over and destroy Syria’s arsenal of chemical weapons. However, Obama still threatened to use force against Syria if the plan fails. We get reaction to Obama’s speech from world-renowned political dissident and linguist, MIT Professor Emeritus Noam Chomsky. “The Russian plan is a godsend for Obama,” Chomsky says. “It saves him from what would look like a very serious defeat. He has not been able to obtain virtually any international support, and it looked as though Congress wasn’t going to support it either, which would leave him completely out on a limb. This leaves him a way out: He can maintain the threat of force, which incidentally is a crime under international law. We should bear in mind that the core principle of the United Nations Charter bars the threat or use of force. So all of this is criminal, to begin with, but he’ll continue with that.” Click here for more. As the federal government shutdown continues, Secretary of State John Kerry heads to Asia for secret talks on a sweeping new trade deal, the Trans-Pacific Partnership. The TPP is often referred to by critics as ”NAFTA on steroids,” and would establish a free trade zone that would stretch from Vietnam to Chile, encompassing 800 million people — about a third of world trade and nearly 40 percent of the global economy. While the text of the treaty has been largely negotiated behind closed doors and, until June, kept secret from Congress, more than 600 corporate advisers reportedly have access to the measure, including employees of Halliburton and Monsanto. “This is not mainly about trade,” says Lori Wallach, director of Public Citizen’s Global Trade Watch. “It is a corporate Trojan horse. The agreement has 29 chapters, and only five of them have to do with trade. The other 24 chapters either handcuff our domestic governments, limiting food safety, environmental standards, financial regulation, energy and climate policy, or establishing new powers for corporations.” Click here for more. Former CIA agent John Kiriakou speaks out just days after he was sentenced to 30 months in prison, becoming the first CIA official to face jail time for any reason relating to the U.S. torture program. Under a plea deal, Kiriakou admitted to a single count of violating the Intelligence Identities Protection Act by revealing the identity of a covert officer to a freelance reporter, who did not publish it. Supporters say Kiriakou is being unfairly targeted for having been the first CIAofficial to publicly confirm and detail the Bush administration’s use of waterboarding. Kiriakou joins us to discuss his story from Washington, D.C., along with his attorney, Jesselyn Radack, director of National Security & Human Rights at the Government Accountability Project. “This … was not a case about leaking; this was a case about torture. And I believe I’m going to prison because I blew the whistle on torture,” Kiriakou says. “My oath was to the Constitution. … And to me, torture is unconstitutional.” Click here for more. A manhunt is continuing in California for Christopher Dorner, the former Los Angeles police officer accused of shooting three people dead. In his online manifesto, Dorner threatened to wage “unconventional and asymmetrical warfare” against a police department he accused of racism and corruption. He was fired from the police department in 2008 after being accused of falsely claiming his training officer kicked a mentally ill suspect in the course of an arrest. On Friday, the LAPD announced it would reopen its investigation of Dorner’s firing and his claims. We’re joined by journalist and activist Davey D, who says, notwithstanding the allegations of murder, Dorner’s manifesto “has opened up old wounds or it’s reaffirmed what people have long suspected or have experienced in terms of [police] brutality. … I’m really curious as to whether or not these allegations that he has raised, where he names dates, times and places and names, whether or not they actually check out. And I think that needs to be really investigated, above and beyond the immediate scenario which led to his firing.” Click here for more. The FBI has added Assata Shakur to its Most Wanted Terrorist List. In addition, the state of New Jersey announced it was adding $1 million to the FBI’s $1 million reward for her capture. Shakur becomes the first woman ever to make the list and only the second domestic terrorist to be added to the list. Shakur, the former Joanne Chesimard, was a member of the Black Panther Party and Black Liberation Army. She was convicted in the May 2, 1973 killing of a New Jersey police officer during a shoot-out that left one of her fellow activists dead. She was shot twice by police during the incident. In 1979, she managed to escape from jail. Shakur fled to Cuba where she received political asylum. She once wrote, “I am a 20th century escaped slave. Because of government persecution, I was left with no other choice than to flee from the political repression, racism and violence that dominate the U.S. government’s policy towards people of color.” Click here for more. The new documentary “Dirty Wars: The World Is a Battlefield” follows investigative reporter Jeremy Scahill to Afghanistan, Somalia and Yemen as he chases down the hidden truths behind America’s expanding covert wars. We’re joined by Scahill and the film’s director, Rick Rowley, an independent journalist with Big Noise Films. “We’re looking right now at a reality that President Obama has essentially extended the very policies that many of his supporters once opposed under President Bush,” says Scahill, author of the bestseller “Blackwater: The Rise of the World’s Most Powerful Mercenary Army” and a forthcoming book named after his film. “One of the things that humbles both of us is that when you arrive in a village in Afghanistan and knock on someone’s door, you’re the first American they’ve seen since the Americans that kicked that door in and killed half their family,” Rowley says. “We promised them that we would do everything we could to make their stories be heard in the U.S. … Finally we’re able to keep those promises.” Click here for more. Lavabit, an encrypted email service believed to have been used by National Security Agency leaker Edward Snowden, has abruptly shut down. The move came amidst a legal fight that appeared to involve U.S. government attempts to win access to customer information. In a Democracy Now! broadcast exclusive, we are joined by Lavabit owner Ladar Levison and his lawyer, Jesse Binnall. “Unfortunately, I can’t talk about it. I would like to, believe me,” Levison says. “I think if the American public knew what our government was doing, they wouldn’t be allowed to do it anymore.” In a message to his customers last week, Levison said: “I have been forced to make a difficult decision: to become complicit in crimes against the American people, or walk away from nearly 10 years of hard work by shutting down Lavabit.” Levison said he was barred from discussing the events over the past six weeks that led to his decision. Soon after, another secure email provider called Silent Circle also announced it was shutting down. Click here for more. A shocking new study by the American Civil Liberties Union has found that more than 3,200 people nationwide are serving life terms without parole for nonviolent offenses. Of those prisoners, 80 percent are behind bars for drug-related convictions. Sixty-five percent are African-American, 18 percent are white, and 16 percent are Latino — evidence of what the ACLU calls “extreme racial disparities.” The crimes that led to life sentences include stealing gas from a truck, shoplifting, possessing a crack pipe, facilitating a $10 sale of marijuana, and attempting to cash a stolen check. We speak with Jennifer Turner, human rights researcher and author of the new ACLUreport, “A Living Death: Life Without Parole for Nonviolent Offenses.” Click here for more. The U.S. government has admitted its troops used white phosphorus as an incendiary weapon against Iraqis during the assault on Fallujah. Chemical weapons experts say such attacks are in violation of international law banning the use of chemical weapons. We speak with columnist George Monbiot and the news director of RAI TV, the Italian TV network that produced the film “Fallujah: The Hidden Massacre.” The U.S. government has now admitted its troops used white phosphorus as an incendiary weapon against Iraqis during the assault on Fallujah a year ago. Chemical weapons experts say such attacks are in violation of international law banning the use of chemical weapons. Click here for more. One day after the exiled former Black Panther Assata Shakur became the first woman named to the FBI’s Most Wanted Terrorists list, we’re joined by another legendary African-American activist, Angela Davis, as well as Shakur’s longtime attorney, Lennox Hinds. Davis, a professor at the University of California, Santa Cruz, is the subject of the recent film, “Free Angela and All Political Prisoners.” She argues that the FBI’s latest move, much like its initial targeting of Shakur and other Black Panthers four decades ago, is politically motivated. “It seems to me that this act incorporates or reflects the very logic of terrorism,” Davis says. “I can’t help but think that it’s designed to frighten people who are involved in struggles today. Forty years ago seems like it was a long time ago. In the beginning of the 21st century, we’re still fighting around the very same issues — police violence, healthcare, education, people in prison.” A professor of criminal justice at Rutgers University, Hinds has represented Shakur since 1973. “This is a political act pushed by the state of New Jersey, by some members of Congress from Miami, and with the intent of putting pressure on the Cuban government and to inflame public opinion,” Hinds says. “There is no way to appeal someone being put on the terrorists list.” Click here for more. Seventeen years ago, TWA Flight 800 crashed off Long Island, killing all 230 people aboard. The official government investigation blamed mechanical failure, but now a group of former investigators are petitioning the National Transportation Safety Board to reopen the probe, saying the original report was falsified. Was the plane accidentally shot down by the U.S. Navy conducting a nearby exercise, or was it a terrorist attack? We speak to the filmmakers behind a new documentary on the crash, ”TWA Flight 800,” formerCBS News producer Kristina Borjesson and Tom Stalcup, a physicist and co-founder of Flight 800 Independent Researchers Organization. We also play an extended excerpt of the film “Shadows of Liberty,” which also explores the controversy. Click here for more. Describing the United States as an “advanced Third World country,” longtime consumer advocate and former presidential candidate Ralph Nader calls for a new mass movement to challenge the power corporations have in Washington. “It is not too extreme to call our system of government now 'American fascism.' It’s the control of government by big business, which Franklin Delano Roosevelt defined in 1938 as fascism,” Nader says. “We have the lowest minimum wage in the Western world. We have the greatest amount of consumer debt. We have the highest child poverty, the highest adult poverty, huge underemployment, a crumbling public works — but huge multi-billionaires and hugely profitable corporations. I say to the American people: What’s your breaking point? When are you going to stop making excuses for yourself? When are you going to stop exaggerating these powers when you know you have the power in this country if you organize it?” Nader has just published a new book, “Told You So: The Big Book of Weekly Columns.” Click here for more. Former President George W. Bush has been forced to cancel a planned trip to Switzerland after human rights attorneys threatened to take legal action against him for sanctioning the use of torture. The Center for Constitutional Rights said they had planned to bring a complaint on behalf of two men who were tortured by U.S. interrogators and held at the military base at Guantánamo Bay, Cuba. “It was disappointing that we’re not able to actually prosecute him,” says CCR legal director Bill Quigley. “But I think it has shown worldwide that even though he was the president of the United States, if you engage in torture… there are consequences. Click here for more. The Obama administration has announced it will keep 19 diplomatic posts in North Africa and the Middle East closed for up to a week, due to fears of a possible militant threat. On Sunday, Senator Saxby Chambliss, the top Republican on the Senate Intelligence Committee, said the decision to close the embassies was based on information collected by the National Security Agency. “If we did not have these programs, we simply would not be able to listen in on the bad guys,” Chambliss said, in a direct reference to increasing debate over widespread spying of all Americans revealed by Glenn Greenwald of The Guardian. “Nobody has ever questioned or disputed that the U.S. government, like all governments around the world, ought to be eavesdropping and monitoring the conversations of people who pose an actual threat to the United States in terms of plotting terrorist attacks,” Greenwald says. Pointing to the recent revelations by leaker Edward Snowden that he has reported on, Greenwald explains, “Here we are in the midst of one of the most intense debates and sustained debates that we’ve had in a very long time in this country over the dangers of excess surveillance, and suddenly, an administration that has spent two years claiming that it has decimated al-Qaeda decides that there is this massive threat that involves the closing of embassies and consulates around the world. … The controversy is over the fact that they are sweeping up billions and billions of emails and telephone calls every single day from people around the world and in the United States who have absolutely nothing to do with terrorism.” Click here for more. A U.S. drone strike killed three people in northwest Pakistan on October 31, marking the first such attack since Pakistani Prime Minister Nawaz Sharif publicly called for President Obama to end the strikes. Amnesty International said the United States may be committing war crimes by killing innocent Pakistani civilians in drone strikes. Today we air extended clips from the new documentary, “Unmanned: America’s Drone Wars,” and speak to filmmaker Robert Greenwald. The film looks at the impact of U.S. drone strikes through more than 70 interviews with attack survivors in Pakistan, a former U.S. drone operator, military officials and more. 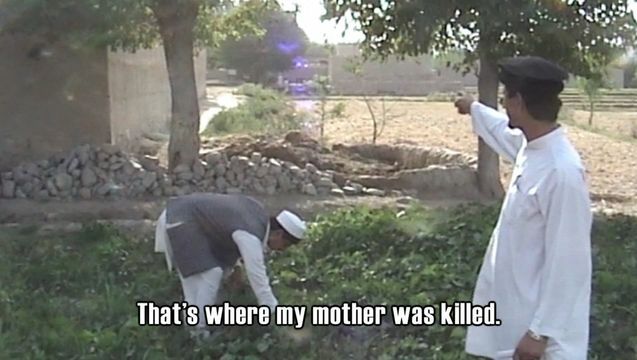 The film opens with the story of a 16-year-old Tariq Aziz, who was killed by a drone just days after attending an anti-drone conference in Islamabad. We are also joined by human rights attorney Jennifer Gibson of Reprieve, co-author of the report, “Living Under Drones.” Click here for more. What do you think is the most important news story of 2013? What was your favorite Democracy Now! interview this year? Join the discussion on our Facebook page.